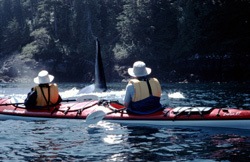 The travel planning information presented on this page is specific to the Johnstone Strait trips. In addition to this information please visit our Travel Planning to Vancouver Island page for additional information on travel planning to British Columbia. Our Johnstone Strait tours depart from Telegraph Cove, near the village of Port McNeill on the northeastern end of Vancouver Island. Guests must plan to arrive in Port McNeill or Telegraph Cove for the evening prior to the trip departure date. If you are travelling to Port McNeill by air and you wish to depart on the evening of your trip’s last day, we advise that you do not make flight departure reservations for any earlier than 6:00 pm. Please be aware that delays, due to weather or other circumstance, of our return to Telegraph Cove could cause you to miss flights. Check with the airline or your travel agent into their missed flights policy. If you travel to Port McNeill by vehicle, there will be time on the last day of your trip to travel onto other Vancouver Island destinations, or return to Nanaimo to board a late ferry to the mainland. If you use motor coach service for travelling to Port McNeill you will need to plan on spending the evening in Port McNeill and make the connection the following morning. There are three travel options for getting to Port McNeill; driving, flying, or motor coach service. If you are driving you will be taking a ferry to Vancouver Island from Vancouver, BC or Seattle, WA. Sailing time from Vancouver to the Island is approximately 1hr. 40 minute to 2 hours, depending on routing. Ferry Information. The quickest route to Vancouver Island if driving from the USA is from the Tsawwassen ferry terminal (just south of Vancouver) to Duke Point (Nanaimo). On the north side of Vancouver there is ferry service from Horseshoe Bay to Departure Bay (Nanaimo). A driving guide is included in your pre-trip information package. Victoria – Port McNeill: 463 km/287 miles. 6 hours driving time. Nanaimo – Port McNeill: 352 km/219 miles. 4.0 hours driving time. Vancouver – Port McNeill: Approximate travel time from Vancouver to Port McNeill by vehicle (including ferry travel time) is 8 hours. If you are flying into Vancouver, BC and planning to rent a vehicle for your visit to Vancouver Island, you may want to consider taking the Island Link Express Bus service to Nanaimo and renting a vehicle on the Island. Island Link Bus offers bus transportation between Horseshoe Bay ferry terminal and the Vancouver Airport, passenger express bus service between most Vancouver Island points and BC Ferries’ services at Nanaimo Departure Bay.bus transportation between Horseshoe Bay ferry and all three Skytrain lines. Once you are in Nanaimo National Car Rental and Budget BC are your best choices in car rentals. This option of travel to Vancouver Island is a considerable cost savings over renting a car in Vancouver. If you prefer to rent a vehicle in Vancouver most major car rental companies offer onsite rentals at the Vancouver Airport. The quickest way to get to Port McNeill from Vancouver is to fly into Port Hardy, which has the closest commercial airport. The Port Hardy airport is only a 20-minute taxi ride to Port McNeill . There are two airlines offering service between Vancouver airport (YVR) and Port Hardy airport (YZT). It is recommended that you allow at least two hours between connecting flights in Vancouver. Pacific Coastal offers an extended summer schedule, featuring many more flights to and from Port Hardy than they do in the off-season. Contact them directly for more information. The following companies provide taxi service for singles or entire groups from the Port Hardy airport to Port McNeill or Telegraph Cove. It is recommended that you contact them directly for current pricing and to arrange for pick-up. The Comox Valley Airport is conveniently located mid-Vancouver Island and is within a scenic 3 hour drive to Port McNeill. The full -service airport offers numerous daily flights from Vancouver, Calgary, and Edmonton with WestJet and Air Canada Jazz. Pacific Coastal, and Central Mountain Air offer daily service from Vancouver. Operates scheduled flights from Kenmore, WA (just north of Seattle) to Port McNeill regularly throughout the summer. Motor coach service is available from Seattle WA, Vancouver BC, and from most locales on Vancouver Island to Port McNeill. Please note that there is only one daily bus to Port McNeill from Victoria or Nanaimo. Motorcoach Information. Accommodation and dining information for Telegraph Cove and Port McNeill can be found here>>. Current weather conditions for the western Johnstone Strait area from Environment Canada.